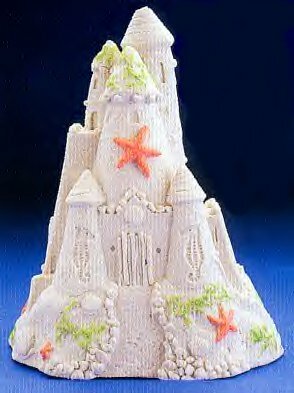 Sandcastle Centerpieces and Sandcastle favors are the perfect centerpiece for beach and fairytale themed events. They make anytime of the year feel like a fairytale or summer. 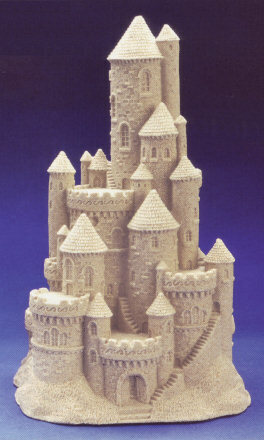 The sandcastle centerpieces come in a variety of sizes to accomadate your event and are made from real sand. 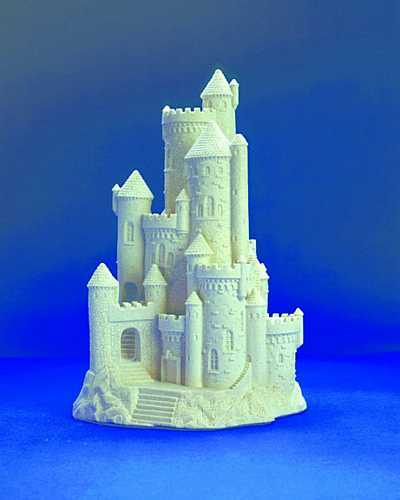 Our sandcastles also come in a variety of colors to match your sandcastle style. All of the sandcastle centerpieces are packaged to ensure safe delivery. 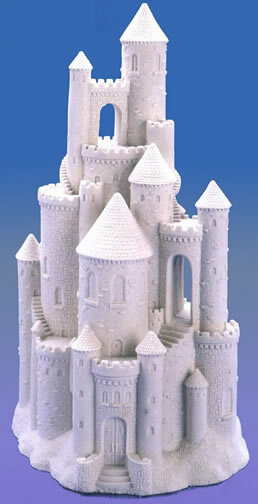 These castles are made of resin and real sand, so they are sturdy. With safe handling, they will last a long time. You can use them for multiple events. Some people raffle them off after their event. It takes up to 2 weeks for the sandcastles to be made. If you have a rush order, please contact us to see what is available to ship quickly. We do not rent the sandcastle centerpieces. We do not accept returns. The sandcastles are made to order. 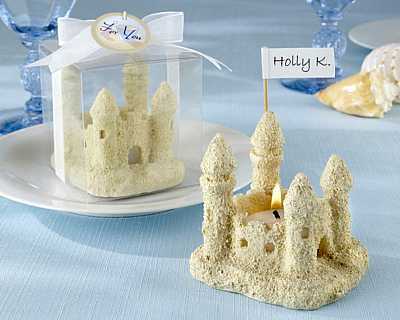 There are sandcastle favors, sandcastle placecard holders, sand castle votive holders, sandcastle centerpieces. 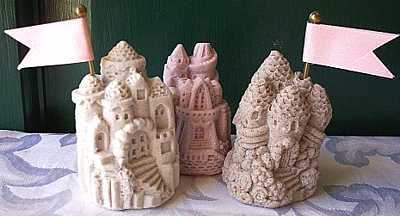 Mini Sandcastle Tea Light Holders A tropical, sun-kissed paradise, the day of your dream, and the light of love in your eyes�all superbly expressed in one perfect favor. 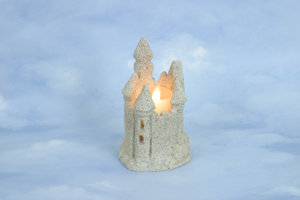 The �Castles in the Sand� Sand Castle Tea Light tells your guests this moment in time may be fleeting but your love is everlasting and, with this gift, they�ll remember your special moment with fondness in the days to come. 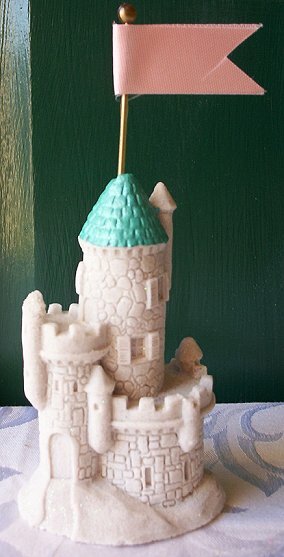 The castle has a sandy texture, tiny windows, a tea light candle, four turrets and a flag of the realm�actually a place card�that flies atop a turret. Classically presented, 3� x 2 �� x 2 �� castle resides in a 3� x 3� x 2 �� display box elegantly accented with a sheer white organza ribbon and bow and a pastel-hued �For You� tag that features a pail and shovel on a sandy shore. Price is per set of 4 mini sandcastle tea light holders. Minimum order is 3 sets. Sandcastle Centerpieces These cute 9" sandcastle centerpieces are made with real sand and are handpainted! This sandcastle centerpiece is the perfect favor for those who like to take a little sand with them. Price is per sandcastle centerpiece favor. Great for beach wedding decorations or favors. Ships in 3-10 business days. These cute 3" sandcastle favors are made with real sand! This the perfect beach wedding favor for those who like to take a little sand with them. You can choose from 2 different colors, white or natural. You can add a silk flag to the sandcastle favors. Use the flags to write your names and wedding date or order the personalized ribbon in the imprinted section and select the favor spacing and put your names on one end and date on the other. Then loop that ribbon on the pole to make a flag! It will save a lot to time. Price is per sandcastle favor. If you don't order the flags, the castles will not have a hole in them. Minimum order is 12 sandcastle favors, then order in increments of 12. 1 assortment per 6 sandcastles. If you order 12, you will have 2 different assorted shapes, if you order 24, then there will be 4 assorted shapes. Up to 6 different shapes. These cute ~4.5" sand castle favors are made with real sand! 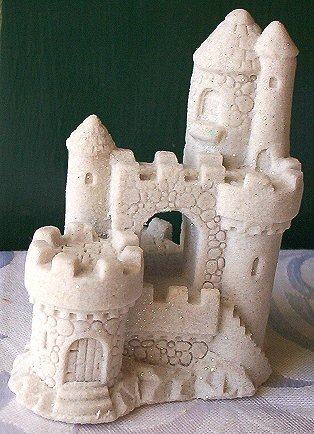 This sandcastle favor is the perfect beach wedding favor for those who like to take a little sand with them. The sand castle favors are handpainted. You can choose from 3 different colors, pink, teal, and blue. Use the flags to write your names and wedding date or order the personalized ribbon in the imprinted section and select the favor spacing and put your names on one end and date on the other. Then loop that ribbon on the pole to make a flag! It will save a lot to time. Or use them to name or number your tables. If you don't choose the flag option, there will not be a hole in the sandcastle favor for a flag. These cute 2" sandcastle favors are made with real sand! This sandcastle favor is the perfect beach wedding favor for those who like to take a little sand with them. You can choose from 3 different colors, white, blue, and natural. You can add a white hard plastic flag. Use the flags to write your names and wedding date or order the personalized ribbon in the imprinted section and select the favor spacing and put your names on one end and date on the other. Then loop that ribbon on the pole to make a flag! It will save a lot to time. If you don't order the flags, the sandcastles favors will not have a hole in them. Price is per favor. Minimum order is 24, then order in increments of 12. 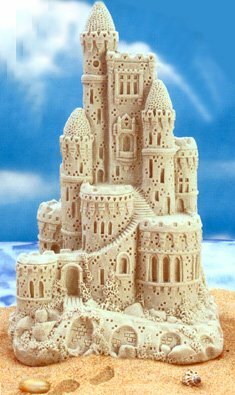 There are 4 different sandcastle styles.